In this study, optimisation of speed gears for a tractor transmission was performed with KISSsoft software. Optimisation was carried out under three constraints. These constraints are input power-torque, volume for system in transmission and gear ratio for each speed. The purpose of this study was to optimize the module, face width, gear quality, centre distance, number of teeth, helix angle, addendum modification coefficient and pressure angle for each speed considering the constraints. Tooth bending stress, tooth contact stress, contact ratio and specific sliding were considered for evaluation during optimisation. Strength calculation of gear pairs which were optimized and defined all geometrical parameters with KISSsoft were also calculated with mathematical model indicated in ISO 6336. Then, the results were compared. Developed power variation of turbo-generator (TG) steam turbine allows insight into the change of turbine energy efficiency and energy power losses. Measurements were performed in five different TG steam turbine operating points and analysis is presented in three randomly selected operating points. Turbine developed power was varied from 500 kW until the maximum power of 3850 kW in steps of 100 kW. Turbine energy efficiency increases from 500 kW to 2700 kW and maximum energy efficiency was obtained at 70.13 % of maximum turbine power (at 2700 kW) in each operating point. From 2700 kW until the maximum of 3850 kW, TG turbine energy efficiency decreases. Change in TG turbine energy efficiency is caused by an uneven intensity of increase in turbine power and steam mass flow. For all observed operating points, energy efficiency during turbine exploitation is approximately 10 % or more lower than the maximum obtained one. A continuous increase in turbine energy power losses during the developed turbine power increase are the most influenced by the continuous increase in steam mass flow through the turbine. Analysis of the structural state and phase composition of surface metal layers after combined treatment of steel which includes preliminary surface plastic deformation of the workpiece, electrospark doping with use of rotating disk electrode 2 mm thick, made of WCCo hard alloy and subsequent surface ball smooth rolling, has been performed. It was shown that the use of combined treatment provides a gradient-layered structure with low surface roughness. Phase composition of the obtained layer consist of ferritic α-Fe phase and a number of carbide phases formed during the interaction of the electrode material with steel: F3W3C, WC and W2C semi-carbide. Wear resistance of the material after treatment exceeds similar properties of the original carbon steel up to 4 times. Plasma arc cutting is a non-conventional manufacturing process that has potential for modern day metal cutting demands with good dimensional accuracy and high-quality surfaces without any extra operation. In this experimental study, AISI 304, AISI 430 and EN S235JR sheet materials having 5 mm. thicknesses, has cut with plasma arc cutting. Each material has cut with 6 different variations. Current, cutting speed, arc voltage, gas pressure and gas flow rate have been changed as process parameters. The quality of the cut has been monitored by measuring the edge roughness, the hardness of the heat-affected zone (HAZ) and the results has compared. The results of modeling the thermal characteristics of microsystems, evaluated mutual thermal influence of the elements depending on the type of construction. In this study, tube side thermal and hydraulic performance of a mini channel shell and tube heat exchanger (MC-STHE) designed using Kern method was investigated experimentally for water and α-Al2O3/water nanofluids prepared in two different low volume fractions (0.02% and 0.2%). The average particle diameter of Al2O3 nanomaterial used in the preparation of nanofluids is 50 nm. The copper tubes (L/D=120) with inner diameter of 2 mm and outer diameter of 3 mm and a length of 240 mm were used in the MC-STHE. During the experiments, shell side water flow rate was kept constant at 180 L/h, while the water and nanofluids flow rates on the tube side were changed between 60-600 L/h. The use of nanofluids in the MC-STHE deteriorates tube side convective heat transfer coefficient in the flow rates below 125 L/h, while enhancing convective heat transfer coefficient in the flow rates above 125 L/h, compared to water. The enhancement ratios for convective heat transfer coefficient compared to water were found to be 0.82-1.66 for 0.02% Al2O3/water and 0.9- 1.74 for 0.2% Al2O3/water in the range of 60-600 L/h volume flow rates. However, in the applications in which enhancement of the heat transfer is desired, it was obtained that the increase in pumping power should be taken into consideration depending on the selected nanofluids volume fraction. According to efficiency index in which increase in heat transfer and pressure drop compared to water are evaluated together, it was found that the use of nanofluids was significant in the flow rates above 375 L/h for 0.02% Al2O3/water and in the flow rates above 300 L/h for 0.2% Al2O3/water. The use of mini-channel increased the compactness by decreasing the weight and volume of the heat exchanger, and in addition to this, higher heat transfer coefficients were obtained by using nanofluids instead of water. During the radial deformation of contouring tool, its active diameter is getting smaller than the initial one, and the cutting depth is becoming lower than planned. Thus, the diametrical size of the machined hole is always smaller than contouring tool, by value of the elastic radial deformation. In this regard, in the manufacture of contouring tool, it is necessary to make appropriate adjustments in the diametrical size of its cutting edge, depending on its elastic radial deformation. 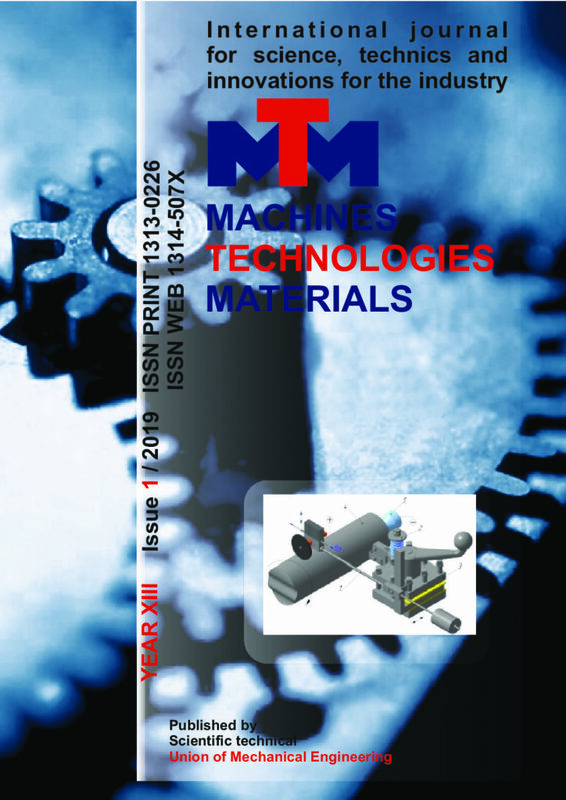 The paper dwells on the thermo-elastic problem of calculating contouring tool for the purpose of determining the actuating diametrical size of its cutting edge, and for determining the area of the application of tool material. Solving of non-dimensional non-stationary problem is carried out by method of finite differences. At each time step, the system of algebraic equations is solved by iterative method. There have been obtained the results for the temperature field and displacement components. In this paper, we present the results of the tribological studies of commercially pure copper (99.9% Cu) and a low-alloyed chromium bronze (Cu-0.5%Cr), contacting a graphite-containing material. The samples under study were produced with two types of microstructures: a coarse-grained (CG) one, having an average grain size of 100-130 μm after annealing, and a submicrocrystalline (SMC) one, having an average grain size of 0.30-0.50 μm after multi-cycle severe plastic deformation (SPD) processing via equal-channel anglar pressing (ECAP) combined with Conform. It is shown that for the samples produced by ECAP-Conform, having an SMC structure, the friction coefficients are 12 – 20% lower than for the as-annealed samples, having a CG structure. Debye’s temperature 0D is the temperature border between areas, CМ/V(Т) has constant value and, when T<0D , begins to decrease monotonically. 0D is the crystal parameter, which allows to calculate the dimensional border between macro- and nanostates. The statement which is found in scientific discussions that 0D depends on temperature is incorrect because it contradicts modern crystal-physical theories. The numerical value  D is defined experimentally and is related to the structure of crystals and to the processes taking place in them.